In a nutshell, I don’t buy the “good debt” versus “bad debt” idea. That doesn’t necessarily mean I think all debt is “good” or all debt is “bad,” I just disagree that there are clear rules that tell you when debt is okay and when it is not. Instead, if there really is a distinction between good and bad debt, I argue that it revolves around the distinction between want and need. Here are a few principles to consider. Know the difference between wants and needs. You should never take out debt for something you want, though you may be in situations to take out debt for something you actually need. For example, if you’re taking out a loan to buy a car because you need it, don’t get a bigger loan to get a “sweet” car because you want that nicer car. Go with a lower-end model that serves your need. Sometimes telling between wants and needs is easy. You don’t need things that are for entertainment purposes only. You don’t need high-end versions of expensive items. Those are things that you should save for, not incur debt for so you can have them now. Another example: my wife and I took out a home loan after much discussion because, with a young child and another one on the way, we were simply running out of room in our tiny apartment. Our loan rode the fine line between want and need – we bought a larger house than we needed at the moment (but far smaller than what we could have been approved to buy), but we also anticipate having more children. Practice patience. 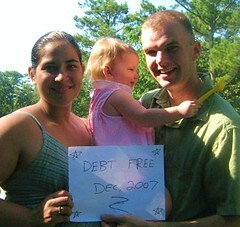 Many people get into debt trouble simply because they are impatient to acquire the things that they want. Instead of waiting until they have the cash in hand to buy that flat-screen television, they put it on the credit card, pay it off in bits and pieces (fighting against a 19% APR), and wind up spending a huge premium just to have it now. Alternately, they could start saving now, actually save less than the cost of the television (thanks to interest rates in the savings account), and purchase the television with cash, incurring no debt. A few months of patience can save hundreds of dollars, and it can also provide time for shopping around for the best price on the item, saving hundreds more. Patience, particularly when it comes to wants, pays huge dividends.